Today, with the vast amount of online resources, many find it unnecessary to hire a professional to handle problems. Many opt for the numerous D-I-Y (Do It Yourself) options available in favor of the lower cost and less time. Unfortunately, this mentality has creeped into the legal world. More and more potential clients look to online resources to solve their legal problems. 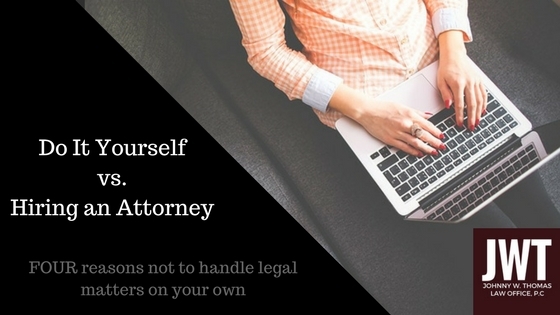 Though some of these online services provide legal guidance from a licensed attorney for an additional fee, most just give you a form and send you on your way. Hey, I’m all for a D-I-Y project here and there, but for legal solutions? You should really leave it to the pros. Seeking legal advice from a competent lawyer may not only save you a future headache, but it may actually save you money as well. Here are FOUR reasons you should hire an attorney instead of going the pro-se route on your next legal matter. An attorney can find the right solution for your problem. When you are faced with a legal issue, many times, there are multiple solutions to your problem. The problem with searching the internet for an answer may lead you to a fix that doesn’t fix much of anything, or even worse, creates bigger problems. A competent attorney will be able to inform you of possible solution to your problem and advise you of the optimal solution with the best outcome. An attorney will do the work for you. Generally, legal remedies include drafting important documents, filing with the Court, responding to pleadings and motions. Legal work may even include an appearance in court. When you hire an attorney, you are taking all that work off your plate and putting it in the hands of the attorney. More importantly, an attorney can make sure the work is done right. The consequences for incorrectly filing a document or missing a deadline can be costly and may have a negative impact on your case. An attorney can see beyond the problem in front of you. Solving your own legal problems can create a high risk of problems in the future. It is second-nature to believe that when we have a problem, we have to fix it right now, thinking little about the consequences of our action. As an attorney, it is our job to think of all of the possible outcomes when considering solutions. Knowing these possible outcomes can not only give you a chance to make the best decision, but you may also be able to limit any risk of future problems. An attorney can be a trusted adviser in a state of emergency or panic. It always feels good to have somebody in your corner! Many times, when we are faced with emergency issues, we don’t clearly consider all the options in front of us. An attorney can be the trusted guidance you need in times of panic or grief.